The GODAE OceanView newsletters & brochures want to inform and highlight GODAE OceanView achievements and progress. After a long gap we are now resuming the productin and circulation of information about GOV with a new newsletter. 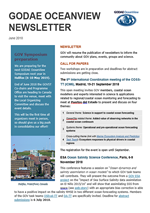 To improve communication with the wider ocean community and to inform internal & external groups of progress within GODAE OceanView in a simple and concise way, we are starting to publish a new GODAE OceanView Newsletter, which is available from this website. The summer school book on 'Observing, Assimilating and Forecasting the Ocean' includes chapters from all of the contributing lectures on the Ocean observing system, Atmospheric forcings and waves, Modelling, Data assimilation, Forecasting and observing systems, Evaluation and Applications, Policies and legel framework is now available from Springer Press.